Through Faith Direct you can make all of your contributions to Holy Family via automatic payment from your checking account or credit card – just as you may do now with your mortgage, household bills, and other monthly payments. This is a great way to simplify your giving – and it’s the most cost-effective, environmentally-friendly way for us to receive your gifts. 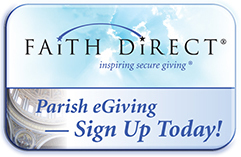 Follow this link or click on the Faith Direct logo above to use Faith Direct today!